Kan-Ra is so dead right now. 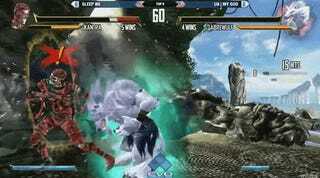 With a sliver of health against Sabrewulf with a full bar of backup, how can he possibly win this match? Watch. Not even Sleep NS, Kan-Ra’s player, can believe he survived the vicious onslaught of UA | My God’s Sabrewulf, but even that miracle should only have delayed the inevitable. With the clock ticking down and the health pool firmly in his opponent’s favor, it looked like all hope was lost for the poor, rotting corpse. All Sabrewulf had to do was keep blocking Kan-ra’s signature sand spam and it would all be over soon enough. But there’s something about a live crowd egging one on that makes ridiculous, borderline magical things happen. Check out baxt3ria’s archive of the match (via Reddit) to see for yourself. The look on My God’s face (below, left) says it all. Sleep NS’s victory halted My God’s tournament progression, locking him in fifth place as Sleep progressed to the loser’s semi-finals. Kan-Ra carried Sleep into the loser’s final, where he fell to Rico Suave, securing third place. Rico went on to defeat GutterMagic’s Thunder and win the EVO 2015 Killer Instinct tournament, but the most memorable moment will always belong to Sleep. Check out our EVO 2015 post to catch the final day of fighting.